A lot of my family and friends know that I love the birds and know a little bit about them. If I don’t my serious birder husband definitely does as he keeps bird lists of birds that he has seen in our backyard, in the county that we live in, the state that we live in, and all other states that we have been to. I would say that he definitely knows his birds more than me. So of course when someone sees an interesting bird they like to tell us about it. One bird in particular, the Crane, stands out as we have been told by quite a few people that they saw one at one time or another. They tell us that they were walking along the beach, or by a lake or pond, and they saw a Crane feeding or walking at the water’s edge. Of course when we hear this we immediately know that it is not a Crane but a Great Blue Heron. How do we know? It is because Great Blue Herons are year round birds in pretty much all of the United States. Cranes on the other hand are usually only seen during their migration time (late September through December) where we live in Kentucky. If you are lucky enough, you may see Sandhill Cranes in flocks flying over as they move south from their northern breeding areas for the winter. So yes some people may be correct when they say they have seen a Crane and that’s why we always ask questions just to make sure. How can you tell the difference between a Heron and a Crane? One sure way is to look at their necks. A Crane’s neck is shorter than the Heron and when flying they stick their neck straight out. The Heron curves its neck into an “S” shape and it is pulled all the way back when flying. Cranes have shorter beaks than herons. Another way is by their behavior. 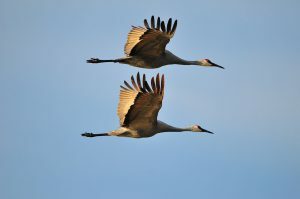 Crane’s travel in flocks together in wide open places and do not go in trees. Herons are more solitary birds and generally are seen alone. Herons will perch and nest in trees as well as marshes, ponds, riverbanks, and fields. You will see Great Blue Herons all year long around lakes, ponds, and beaches but you will not necessarily see a Crane (depending on where you live) This is because we only have 2 types of Cranes in North America which are the Sandhill Crane and the Whooping Crane. The Whooping Crane is endangered with about 220 documented birds so it is going to be less likely to see one. 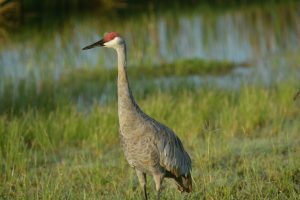 Sandhill Cranes live way up North during breeding season, migrating more south from about late September through December. Great Blue Herons live in both freshwater and saltwater habitats feeding on fish, reptiles, insects, and other birds. They can also be seen in grasslands and agricultural fields stalking frogs and small mammals. 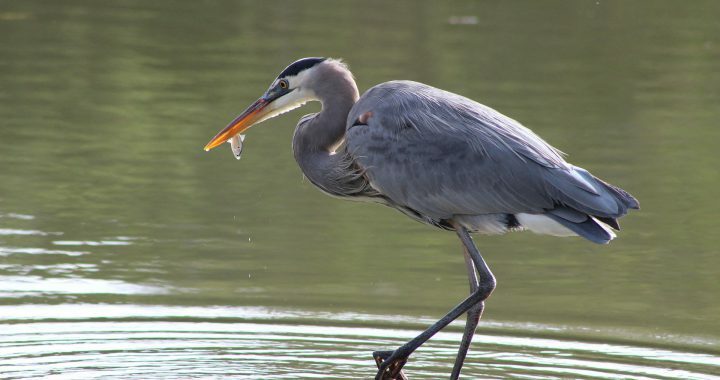 The oldest Great Blue Heron lived to be 24 years old. Most live to be 15 years old. Great Blue Herons can be anywhere from 3 to 4.5 feet tall. Their wingspan 5.5 to 6.6 feet. They can quickly strike prey at a distance with their specially shaped neck vertebrate. They can hunt both day and night with their specially adapted eyes. While Great Blue Herons are very solitary birds they will nest in colonies. Male Herons are monogamous birds but find a different mate each year. Herons nest not only in trees but also on land using grass to build their nest instead of sticks. 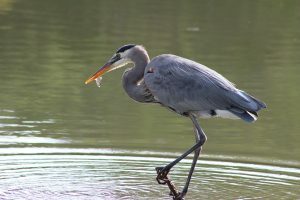 The Great Blue Heron is a stately looking bird that is very similar to the Crane, another stately bird. Both birds are grayish in color, have long legs, and long necks. Many people mistake Herons for Cranes because of this but they are not of the same family. Cranes are taller but have shorter necks and beaks. When flying Cranes stick their necks straight out while Herons curve their neck into an “S” shape and pull it way back. 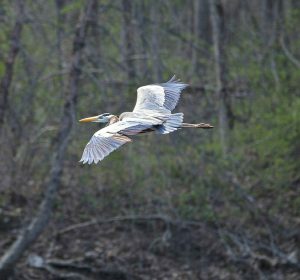 Herons are solitary birds that you can see along the shoreline of a lake, beach, or pond. 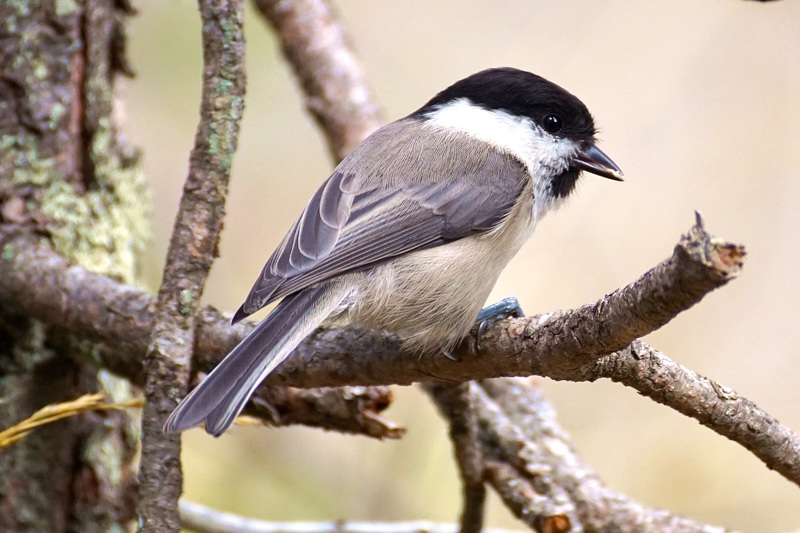 They like to perch and nest in trees, marshes, and riverbanks. You may also see them in fields as they like to feed on frogs, birds, and small mammals. On the other hand, Cranes are generally seen in large flocks in open lowlands and agricultural fields. They eat small rodents, fish, amphibians, insects, grain, berries and plants. Whether you see a Great Blue Heron or a Crane you can’t go wrong. Both are majestic birds that are great to see in the wild! Can you tell the difference between a Heron and a Crane? Do you have any comments that you would like to make about this post? I would love to hear from you. Please do so below. Posted in Backyard Birds, Ducks, Geese, Shorebirds.